Hallelujah! We have a winner! 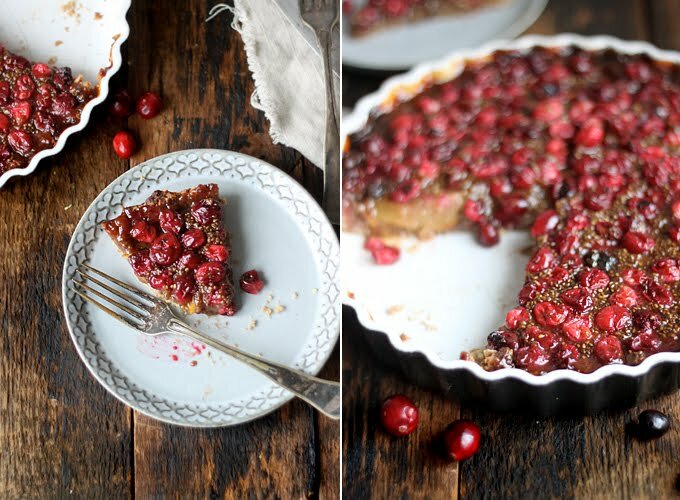 Congratulations to Megan B. and her incredible Cranberry & Pear Tart! I have to say, this was not an easy decision my friends. And of all things to win this challenge, a dessert?! Yes, I too am shocked. Entries upon entries poured in with sweet potatoes, butternut squash, Hokkaido pumpkins, and I was seduced by a tart? But I was. And I am. And so shall you too, because this pastry totally gives it. I think I will start off by saying a few words about this process, which was kind of like a dream come true. I ask for awesome, and everyone steps up to the plate. But I can’t quite believe the culinary prowess so many of you possess, of which you have never had the decency of sharing? C’mon people. I think the majority of you should consider starting your own food blogs because you’ve clearly been holding out on us all. Not fair. Anyway, so the teasing went on as the recipes poured in, and I became a very hungry girl indeed. After begrudgingly eliminating the dishes that I wasn’t going to prepare (I wanted to eat everything), I set my focus on a select few that I knew had crazy-delish potential. Therefore, I will take this opportunity to give due shout outs to the following: Solstice Squash, Nut-Crackin’ Apple Salad, Stuffed Pumpkin, Sweet Potato Gnocchi, Kale Pesto, and Quinoa Cabbage Rolls – you know who you are. And now I know you are all thinking again: Sarah, seriously. A tart? The answer is still a resounding yes. This dessert is amazing. Let’s forget for a moment that it is vegan, gluten-free and sugar-free, and just focus on the delectable elements that combine to create perfection. First of all, fresh cranberries – where have you been all my life? I have only ever seen pictures of you on the bottles of fake neon juice, and urinary tract prevention supplements at the health food store. The closest I’ve come to you is craisins, which are a sad, sweetened excuse for a cranberry indeed. Fresh cranberries are oh so tart and vibrant, bursting with bright juices and tangy goodness. You are my new best friend and can’t wait to play with you more. Then we need to talk about the crust, which I was totally skeptical of. After removing the dough from the food processor, it was wet. Like, really wet. And I could not begin to understand how it would cook under all that filling. Somehow this crazy mélange turns from healthy goop into flaky gorgeousness that it not full of lard and sugar. I would highly recommend you tucking this crust recipe alone into your back pocket for the next time you need a pie base – it is officially my new go-to. The filling is a caramel-like mix of brown rice syrup, coconut oil, and chia seeds. The original recipe called for flax, but I find that flax seeds can sometimes give off that classic, Omega-3 ‘fishy’ flavour that I just don’t dig. I made the switch to chia seeds because they really are tasteless. I soaked them in pear juice instead of water for a little extra sweetness, but you could use apple juice or any other unsweetened juice you like. On to looks – the tart is undeniably gorgeous. I could not stop photographing it. She worked those angles and made serious love to the camera. Although aesthetics were not a must in this challenge, I have to say that the glistening tops of those bright red berries completely begged me to capture them. And how unhealthy does it look? Very. No one dives into the mysterious bowl of brown mush on the Christmas buffet table. No matter how delicious it may be, we all know the prettiest dish gets eaten first. And this is the prettiest and the healthiest. Consider your meatball-lovin’ uncle fooled. Whew. Enough talking. Here is the recipe. 3. For the filling, combine the flax or chia with the water or juice and set aside until a gel forms. Mix the cranberries with remaining ingredients and stir until well combined. Add the gel and fold to mix. Pour filling on top of crust and pear layer and spread evenly. Bake for 35-40 minutes. 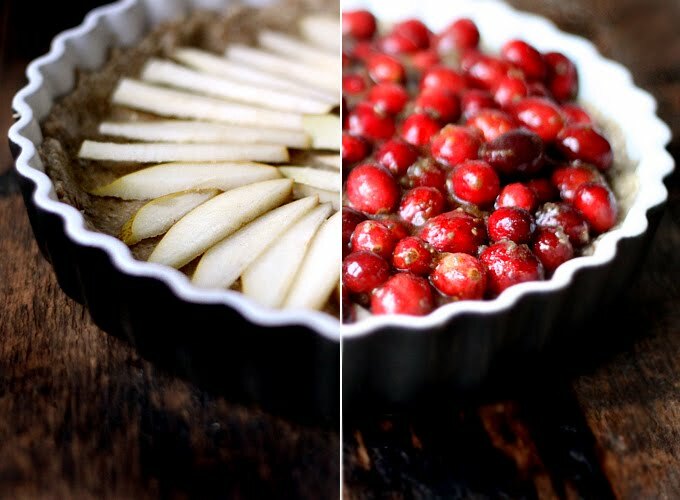 Allow tart cool completely before removing from tart pan (approx.1 hour, or place in the fridge). 4. Slice and serve with an optional dollop of cashew cream, sheep’s milk yogurt (pictured), crème fraîche, or ice cream. Afterthought: a drizzle of melted, dark chocolate. Ugh. Overall, I’d say this challenge was a great success. A challenge – yes. I really had a hard time deciding between which unbelievably delicious dish to choose. As a thank you to everyone who participated, and even those that did not, please check out My New Roots on December 25th for a very special Christmas gift from Sarah B. to all of you! I want to spread some love, but that is all I will say for now. You’ll have to return to see what I’ve hidden for you under the imaginary tree. Love and cranberries, Sarah B. This is so beautiful and tasty. I made it 2 days ago to my child’s birthday and all the family gave me positive compliments. The children so loved this. it’s without a doube a perfcet recipe. Made this pie crust for a plum pie and it was peeeeeerfect 🙂 turned out nice and crunchy! This prize winning pie sounds fabulous and I am making it for a dinner party this weekend. My question to those who have made it, or to Sarah or to Megan, can I make the pie the day before the dinner party? I really hate trying a new recipe the day of the event and look for recipes that I can make in advance. Thank you so much! We really love the Life Changing Bread and Crackers, and am about to make the crackers now. I made it yesterday, this tart is so so good! Thank you for posting Megan’s recipe. Hi! I made this tart last week-end and everybody (non-vegan-at-all people) loved and asked me for the recipe. I used honey in the crust and melasse in the filling, both less than the sweeteners in the recipe. We didn’t have fresh cranberry in France (as far I know it) so I used frozen cranberries (airelles). I’ll do this tart again (and again). Thanks a lot to Megan! Made this tart for a dinner party last night, and everything about it from the prep to the finished product was simply flawless and spectacular. All diners loved it. And as something all of you fellow “mindful foodies” can understand, there’s something about making a treat filled with good and good-for-you ingredients that makes it feel so special. Thank you Megan and Sarah for a unique tart. I have a question in general about chia seeds and flax seeds. The original recipe uses flax seeds as I understand, but it is also possible to use chia. I’ve heard a lot about chia seeds, but as far as I know, it is quite difficult to get them here in Russia. I found them online at about $40 for 500g. Is that a normal price??!! 🙂 I have no idea! Anyway, I’ve seen flax seeds at my local market though. Are they generally an interchangeable product or do some recipes require chia seeds in particular? Also, I suppose would a purchase of 500g last for a while? A foodie investment perhaps? Thanks for any info you can provide, your wonderful site, and to Megan for this delish looking recipe! Hi Sarah and everyone, I am really excited to try this recipe, it looks so good. However, I am not able to find fresh cranberries. Does anyone has any suggestions to modify the topping of this cake?? Hi Mar – you can use any berry, even frozen would work I think! 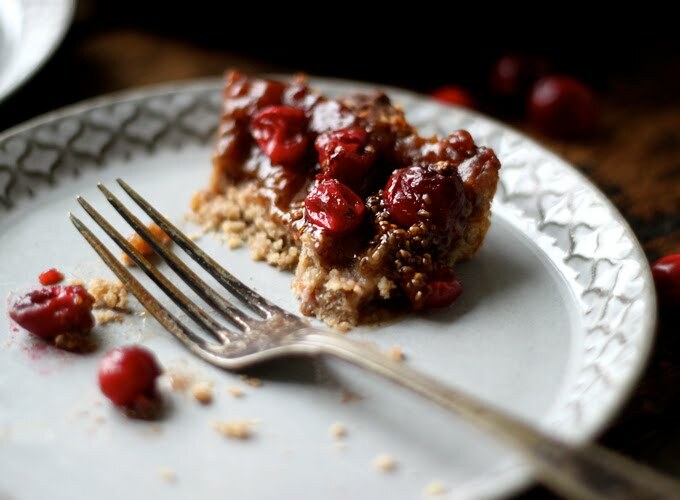 Ok so I have had my eye on this recipe since you first posted it Tuesday, 20 December 2011…I finally made it for a Thanksgiving Celebration Coffee and Cake time with friends, non vegan friends. My daughter and I made all the traditional stuff: pumpkin pie, apple pie, an assortment of favorite cookies and then I made this for me, since I am eating mostly vegan these days. To my surprise not only was is scrumpt-delicious but it was the favorite dessert to all discerning adults. Thanks! Wow this looks wonderfull! Can’t wait to try it out 🙂 Just a quick question: Can you use eggs instead of the flax or chia, if you’re not vegan? I believe to remember having read somewhere, that flax is used for the same purpose than eggs – but I’m not sure about it. All the best, and keep up the amazing work, I’m a great fan of your blog, Sarah! This looks absolutely amazing! I can’t wait to try it! I love anything with rolled oats, they are my favorite. Gorgeous! My oh my oh my oh my! This looks divine!!!! I think I may make this for the New Year. Looks like a great way to celebrate if you ask me. Thank you Megan and Sarah! I didn’t put any sweetener in the crust, just used a couple of tbs of nut milk to get a good texture. Each to their own taste, but for us the resulting sweet/tart balance was perfect. P.s. why can’t the measurements for honey butter and stuff like it be in their weight? I mean, it is quite an ordeal to get it A into the measuring cup and then B to get it out. I mean cups are standard measurements now right? 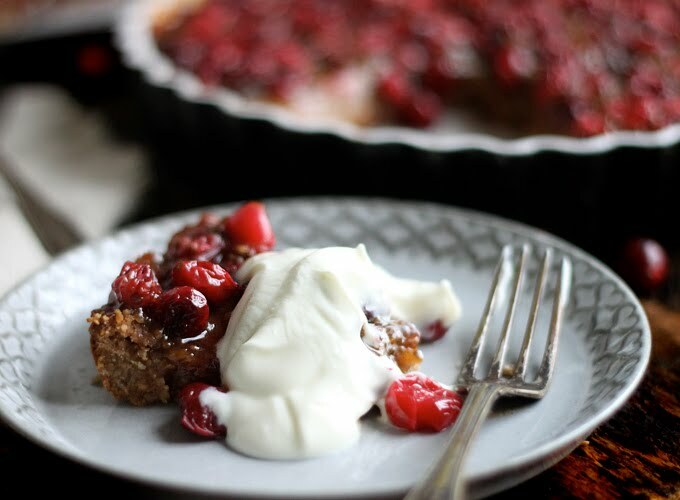 This is delicious (I made it for Christmas) however the cranberry’s definitly need something like whipped cream to soften their acidity. We added vanilla to the cream, highly recommended (there are vegan whipping creams out there). It was also easy to make although I was worried about the wetness of the filling. It came out with a great consistency, taste and look! Oh and THANK YOU also for the gluten-free portion!! Yet another hurdle for my family to adjust to in my diet–whoohoo for this recipe! My sister made this tart for Christmas!! It was delicious! She was trying very hard to support my husband and my vegan/sugar-free lifestyle & this was her first recipe of this sort that she tried! For ONCE at a family gathering, my husband and I were able to eat dessert! Thank you Megan for creating it & thank you Sarah for posting it!! I made this today for Christmas with my family. It turned out well. I made a half batch using honey rather than agave. I was low on honey, so for the crust I even used half the called for amount of honey and added a Tbsp extra water and some other sweetener. Other notes… the cranberries stayed quite tart. I think this may have been because I made a half recipe, so the filling didn’t cover the berries really. They were just sort of sitting on top of the pears. The lemon zest flavor was quite prominent, too, but it was nice. And I added some stevia extract for extra sweetness in the filling. I think it was a good call. All in all, it was great! Everyone seemed to like it and I’ll probably make it again. Thanks for sharing the recipe, Sarah! Holy moly, that is gorgeous. I cannot wait to try Megan’s tart. Your photographs are beautiful; those cranberries look positively illicit! I’ve never seen fresh cranberries in France either, but if they’ve arrived in Denmark hopefully they will be here soon. Perhaps I’ll try this with pears and raspberries as I’m intrigued by the pastry. Sarah, may I just pick a nit re your key words: the recipe as it stands is not vegan because it contains honey, which is an animal product. It could be replaced by agave or maple syrup, but depending on the type of honey (firm or runny?) that might make the pastry too wet, so you would need more oats perhaps… I’ll experiment and let you know. Hi Bea, An alternate crust you could use is just a combination of nuts and dates. Use two cups of whatever nut you like (pecans, walnuts, macademia nuts…) and 1/2 cup pitted dates. Just process them together in the food processor, then press the mixture into a greased tart pan. Great point about the buckwheat, too. Pure buckwheat is gluten free, but it can be combined with wheat. So read those labels! Thanks, Bea! I can’t wait to prepare this recipe! It looks sinful delish!! Though I have a question concerning the oats. Since I am on a grain free diet what can I substitute the oats with? What about the buckwheat? It may or may not be gluten free depending where it’s processed. Hi Mariah, If you just can’t wait for that food processor, you can still make the crust by just mixing the old fashioned way. Processing will make it smoother, but you can always just mix the ingredients with a wooden spoon and once everything is well combined, press the crust into the tart pan. Good luck! Hi Anon, The gel comes from the ground flax seed or chia seed mixture. Just combine either 2 tbsp ground flax OR 2 tbsp chia seeds with 6 tbsp of water. Whisk with a fork and set aside until it thickens – it will have a gel-like consistency. While it does it’s thing, you can continue prepping the other ingredients and then just add it when ready. Thanks for asking us to clarify! Hi Sarah, the tart looks amazing! Am just wondering, you mention gel in the filling but not in the ingredients. What kind of gel do you recommend and how much? Thanks, Stephanie! Hi Olga – I recommend trying honey if you don’t have brown rice syrup. It has a similar consistency and I think would work best. Good luck! Hi Santanjl – Since different types of flours vary in protein, they have different weights. That’s why I used grams for the measurement. Buckwheat is a denser flour so for instance, you wouldn’t need quite as much flour as if you were using wheat. 75 grams of buckwheat is about half a cup. Hope that helps! Sarah, this looks great! I really want to try it but I am not sure I can buy rice syrup. Can you recommend any substitute? Maple syrup is here but it’s so expensive!!! Is agave syrup ok? How many cups is 75g of buckwheat flour? Oh my goodness, I am so excited to have gotten a mention in this post! I can’t believe it. Unless more than one person submitted sweet potato gnocchi, of course. Either way, a very worthy winner, congratulations to Megan. This tart looks delicious. I have to be honest, I don’t normally bake gluten-free, but this tart looks absolutely stunning! Btw, read your article in Kinfolk on my ipad yesterday and absolutely LOVED it! Thanks so much for sharing it. Happy holidays! Not only is the tart gorgeous but the recipe looks so smart and unique! That looks so yummy! Hopefully I’ll get the food processor on my Christmas list and make this first! Thank you all — I’m flattered to have my recipe featured and thrilled to hear your excitement about the tart! I would think that frozen cranberries would do just fine in the recipe. Be sure you thaw and drain them first though just to be sure the filling doesn’t get too wet. For the filling, if you don’t have brown rice syrup, I would think the next best thing would be honey since it has a similar thick consistency. Then maybe molasses. I’m not sure able maple syrup, that might not hold everything together as well. If you do try any substitutions I’d love to hear how things turn out. So keep us posted. Happy baking! i want to make this NOW. i have everything but the brown rice syrup. could i substitute maple syrup/molasses for the brown rice syrup, or do i need to run out to the store? Congratulations Megan!! 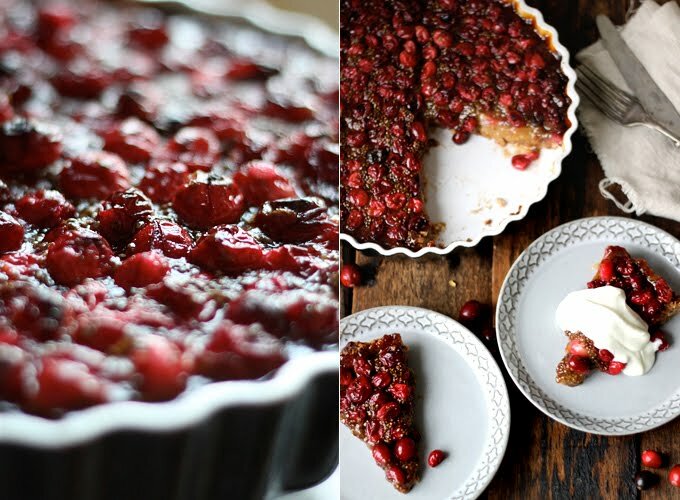 I’m definetely going to try this recipe, perhaps with lingonberries or with red currant. Or with frozen cranberries, that should do, right? Can I change the brown rice syrup to anything else? Have never seen brown rice syrup here in the stores… (Sweden) Oh, and the other finalists – it would be awesome if you could share the links to their blogs or something, (if they have any) so we can be even more inspired! Hi Anon – good question. When I say something is sugar-free, I am referring to refined white sugar. Yes, brown rice syrup is a sweetener, but the glycemic index is considerably lower than many natural sweetener alternatives. I am completely overjoyed that you liked my Nut Crackin’ Apple Salad! Congratulations to the winner and Meghan’s tart looks a-m-a-z-i-n-g and I can’t wait to give it a go! Whoa, how can brown rice syrup be ‘sugar-free’? wow everything looks absolutely incredible! i gotta try this now! What a beautiful tart! I’ve been looking for something special to bring to our family gathering this year – and I think I may have a winner. Thanks for the inspiration!